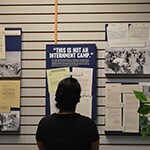 The Social Justice Program will bring a nationally recognized exhibit, “The Architecture of Internment: The Buildup to Wartime Incarceration,” to the UP campus from Saturday, March 3 to Friday, March 9, in St. Mary’s Student Center. Produced by Portland-based Graham Street Productions, which creates “socially relevant documentaries, books and exhibits to educate, inspire and mobilize audiences,” the exhibit explores how Oregonians participated in the decision to incarcerate Japanese Americans and Japanese immigrants during World War II. It includes personal letters and proclamations to Oregon Governor Charles A. Sprague in 1941 and 1942, advocating for the exclusion and incarceration of Japanese American Oregonians; the governor’s response to these letters; blueprints of potential civilian prison locations; letters from Japanese Americans responding to this injustice; and more. All are welcome to view the exhibit and discuss its implications for contemporary responses to racism and xenophobia. Cosponsors include the departments of communication studies, English, history, philosophy, political science, sociology, and social work; diversity and inclusion programs; CISGO; International Club; Filipino American Student Association; and the Moreau Center. For ADA accommodations and more information, contact Alice Gates, social work, at gatesa@up.edu.